For details regarding the individual nodes, please also refer to the node descriptions within KNIME. This documentation page is rather intended as an overview, not as a copy or replacement of the node description. The purpose of this node is to identify unconnected components in data representing a network of any kind of artifacts. The same result can be achieved with the KNIME Network Mining extension and the Network to Row node, however at considerably higher effort and lower speed. Our solution takes an edge table as input consisting of two String columns. Each row represents an edge in a network between the nodes represented by the String columns. The result is a table with a String column representing all unique nodes found in both String columns and a cluster ID column that logically links all nodes of a connected network component. If two nodes have different cluster IDs, there is no connection (not even a transitive one) between them in the provided network. 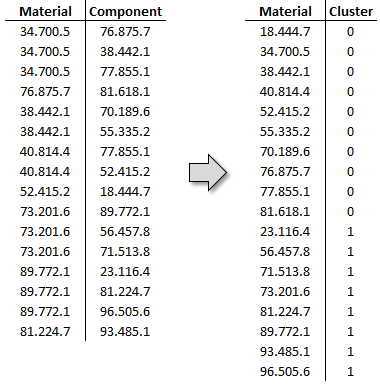 Examples for this node’s applicability are: * In production, new products can be assigned to facilities at minimal footprint complexity by keeping distinct material clusters in distinct entities. * In logistics, hazardous goods can be analyzed for the ability to ship in one delivery. * In human relations, an organizational chart analysis can reveal data quality issues with employees whose reporting lines do not end at the CEO.